Endobronchial malignancies are usually associated with bronchogenic carcinoma. About 1.1% of cases may be due to extrapulmonary source of metastasis. Only few case reports have mentioned about the carcinoma of prostate with mediastinal lymph node and endobronchial metastasis. Here, we report such a case where endobronchial lesions were removed bronchoscopically and the patient improved symptomatically. Biopsy showed the metastatic adenocarcinoma and immunohistochemistry was positive for prostate-specific antigen. Endobronchial malignant lesions are most commonly associated with primary lung tumor. Even though secondaries can cause endobronchial lesion rarely, prostate cancer causing endobronchial metastasis is extremely rare. The usual pattern of metastasis in carcinoma of prostate is hematogenous and lymphatic spread. Lymphangitic spread is the most common radiographic presentation of lung metastasis in carcinoma of prostate. 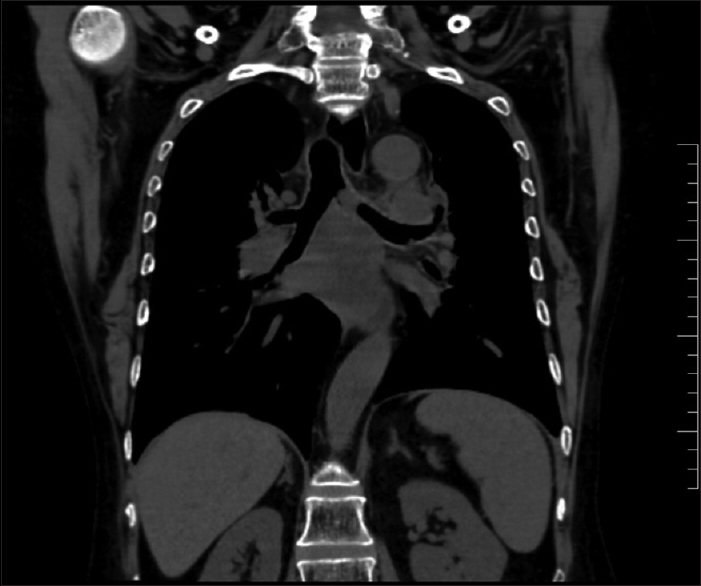 Here, we report an unusual presentation of prostate malignancy with mediastinal lymph node and endobronchial metastasis. A 63-year-old male, diabetic, diagnosed to have carcinoma of prostate in 2007, with multiple bones and mediastinal lymph node metastasis, was presented to us with breathlessness for 2 weeks. He was initially been treated with palliative radiotherapy for symptomatic bony metastasis and had received injection leuprolide 22.5 mg at 3-month intervals for 2 years. Later in 2010, he had increased cough and positron-emission tomography (PET) scan showed the multiple bone and mediastinal lymph node metastasis. He received palliative chemotherapy with docetaxel 135 mg for six cycles at 3-week intervals, followed by received abiraterone 1000 mg daily along with injection leuprolide 3.75 mg on a monthly basis for 9 months. He received mediastinal radiation therapy in palliative intent and was currently on palliative chemotherapy with cabazitaxel 43 mg at three weekly intervals (completed first cycle). He started to have breathlessness for the past 15 days. It increased on exertion, lying in supine position, and relieved on lying to the left side. No associated chest pain, cough, or hemoptysis was present. His routine blood evaluations were within normal limits. Noncontrast computed tomography scan of thorax revealed multiple enlarged mediastinal lymph nodes and an endobronchial lesion in left main bronchus [Figure 1]. Bronchoscopy showed the three glistening globular lesions at the anterior end of carina and the left main bronchus opening [Figure 2] with the largest one was measuring 1 cm × 0.8 cm. These were removed in toto using snare and electrocautery. The postprocedure period was uneventful and the patient was discharged. Histopathology showed bronchial tissue lined by metaplastic squamous epithelium with underlying neoplasm composed of cells arranged in nests, cords, and scattered singly separated by fibrous stroma [Figure 3]. The cells had a moderate amount of eosinophilic cytoplasm and moderately pleomorphic vesicular nucleus, some with distinct nucleolus. 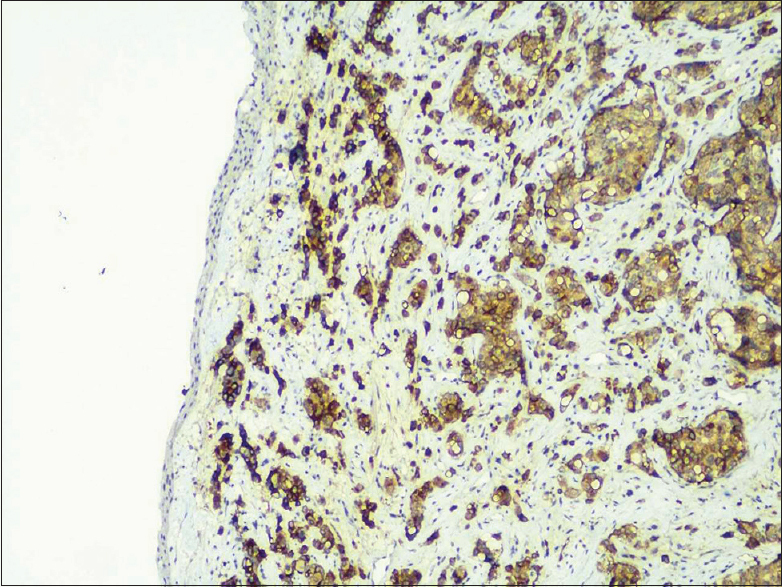 On immunohistochemical examination, the tumor cells were positive for prostate-specific antigen (PSA) [Figure 4] and negative for TTF1, CK7, CK20, CD56, and CK5/6. Overall features were in favor of metastasis from prostatic carcinoma. He was advised to continue chemotherapy with cabazitaxel. It is difficult to differentiate endobronchial metastasis of extrapulmonary malignancies from bronchogenic carcinoma. The endobronchial metastases have similar clinical and radiological findings but with different treatment and prognosis in comparison to primary lung cancer. However, endobronchial metastases are commonly underestimated by the clinician as bronchoscopy is not routinely performed in the presence of existing malignancy history. The treatment modality of endobronchial metastasis may different basing upon types of histological features of the primary malignancy, biologic behavior, anatomical location, evidence of other metastatic sites, present symptoms, patient performance status, and life expectancy. Our patient was diagnosed to have metastatic adenocarcinoma of prostate in 2007 and was on treatment with multidisciplinary team approaches. Even though PET scan showed the reduction in size of mediastinal lesions following radiation therapy and cabazitaxel, he developed respiratory symptoms due to airway metastasis. Bronchoscopy showed the left main bronchus had multiple glistening endoluminal masses and biopsy, followed by immunohistochemistry positive for PSA confirms endobronchial metastasis with the prostatic primary. PSA positivity is specific for cancer of prostate origin and any tissue positive for this other than prostate is likely its metastasis. 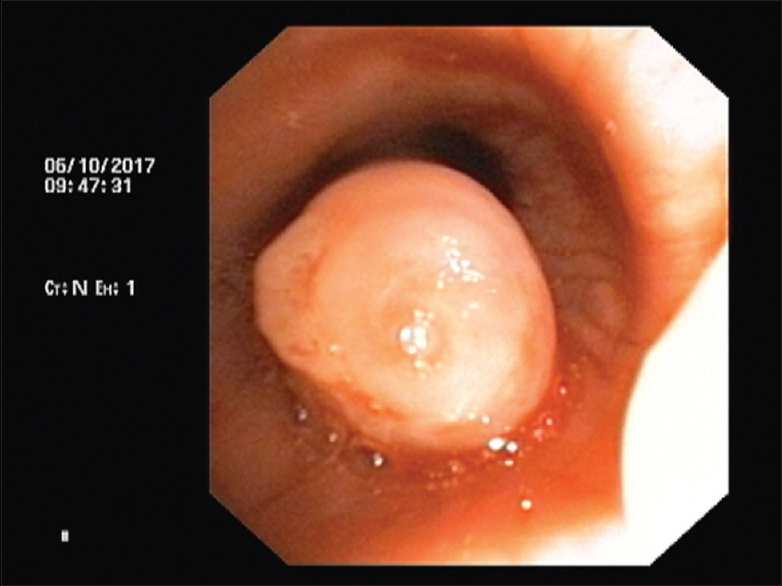 Here, an endobronchial lesion caused partial obstruction of large airway and debulking of the tumor was possible with flexible bronchoscopy. The recommended treatment is androgen suppression and chemotherapy for prostate malignancy with metastasis. However, the patient's respiratory symptoms completely subsided after the bronchoscopic intervention. He was advised to continue chemotherapy with cabazitaxel. 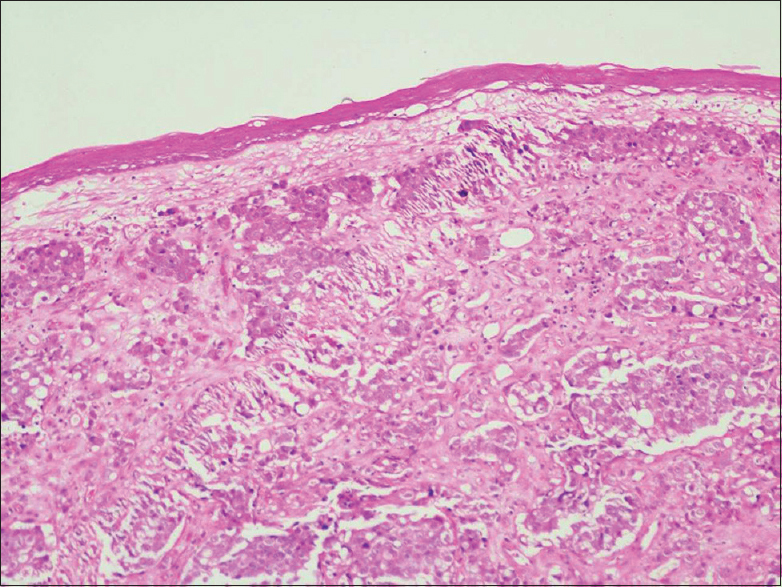 Carcinoma of the prostate with endobronchial metastasis is an unusual presentation. Our report emphasizes the need for multidisciplinary team approach and need for bronchoscopic interventions in such conditions. Hanyu T, Kanda T, Matsuki A, Hasegawa G, Yajima K, Tsuchida M, et al. Endobronchial metastasis from adenocarcinoma of gastric cardia 7 years after potentially curable resection. World J Gastrointest Surg 2010;2:270-4. Shen Q, Yao Y, Teng X, Zhou J. Endobronchial metastasis from prostate cancer mimicking primary lung cancer. Intern Med 2010;49:1613-5. Kenny JN, Smith WL, Brawer MK. Endobronchial metastases from prostatic carcinoma. Ann Thorac Surg 1988;45:223-4. Gerogianni I, Gravas S, Papadopoulos D, Terzis A, Nakou M, Tzortzis V, et al. Endobronchial metastasis from prostate cancer. Int Urol Nephrol 2008;40:961-4. Bonney A, Bowden P, Antippa P, Steinfort D. Endobronchial prostate metastasis. J Bronchology Interv Pulmonol 2017;24:e1-3. Garai S, Pandey U. Prostate cancer presenting as an endobronchial mass: A case report with literature review. Int J Surg Pathol 2010;18:554-6. Perez NE, Maryala S, Seren S, Feng J, Pansare V, Dhar R, et al. Metastatic prostate cancer presenting as mediastinal lymphadenopathy identified by EUS with FNA. Gastrointest Endosc 2007;65:948-9. Vinjamoori AH, Jagannathan JP, Shinagare AB, Taplin ME, Oh WK, Van den Abbeele AD, et al. Atypical metastases from prostate cancer: 10-year experience at a single institution. AJR Am J Roentgenol 2012;199:367-72.